The monthly newsletter at Memorial Presbyterian Church was dying. It was basically a recap of the month’s Sunday bulletins, with a few other announcements, that become less and less engaging. While it eventually went away, the church leadership knew they still needed a way to communicate with the congregation of 275 and the surrounding Midland, Michigan, community. In the search for finding the right communications tool, MPC’s communication committee started out by surveying the congregation about how they received information from the church in the past and how they like to stay connected in the future. 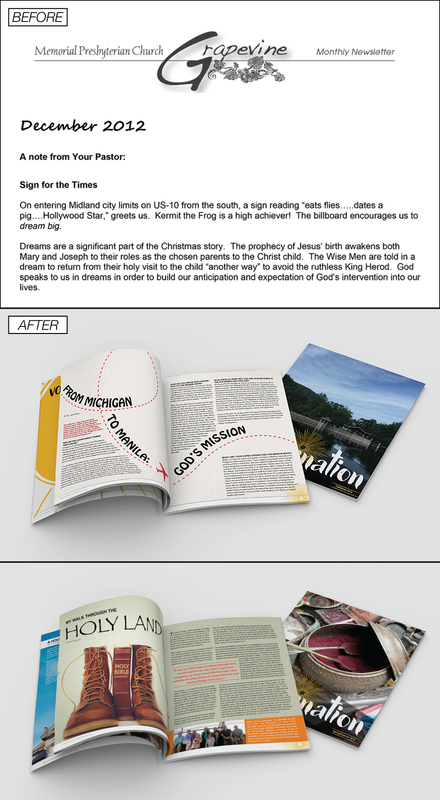 Illumination started out as bi-yearly publication written by church members and people in the community. (Thanks to its popularity, it will soon become a quarterly publication.) The goal was to not only inform the congregation about church life, but also to let the community learn more about what MPC was doing. “[We wanted] to create a publication that allowed the community a deeper understanding to who we are as a church and offer an opportunity for visitors to stop by and worship or participate in an event,” explains Katie. Creating a publication like this takes a dedicated committee with the right people involved. MPC made sure they had a writer, editor and someone with a design eye in the group. The transformation in quality from the old newsletter to Illumination was amazing. It’s a beautiful publication. The process for developing the new magazine was good, too. It would have been easy to ignore print, but a survey of the congregation showed that’s how they preferred to stay connected. A key piece of good communication strategy is understanding your audiences needs. While the print publication is working, MPC also realizes it takes multiple communication tools to keep folks connected. Their next project is installing two interactive kiosks to engage younger church members as well as streamlining other church processes. Our church has only 50 to 60 members but our facility is large enough to double in size. It would be great to be able to reach out to the community through a newsletter like this but I don’t know if we can afford it. What does it cost to produce? I was wondering the same thing as Vicki above. That looks like a pretty expensive publication; obviously sent to a printer, not done in house. It was also laid out by a professional graphics person, which many churches don’t have access to. Having said all that, it is a very nice publication—I can see where the community would engage with it and possibly decide to check out the church as a result. We are blessed to have an excellent communications committee with a professional designer, and several writers on it making this an affordable publication. It is printed at a local print shop, but the costs are very reasonable. I am willing to answer any additional questions you may have via email.